Ferrari Land has now opened its doors to the public. 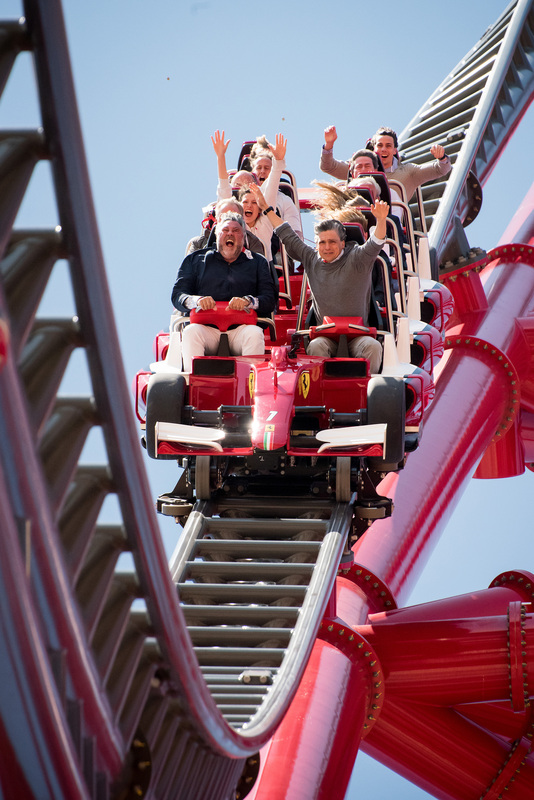 This is the first Cavallino Rampante theme park in Europe and the second in the world after Ferrari World Abu Dhabi. It occupies an area of 70,000 square metres within the PortAventura World resort, about an hour away from Barcelona. 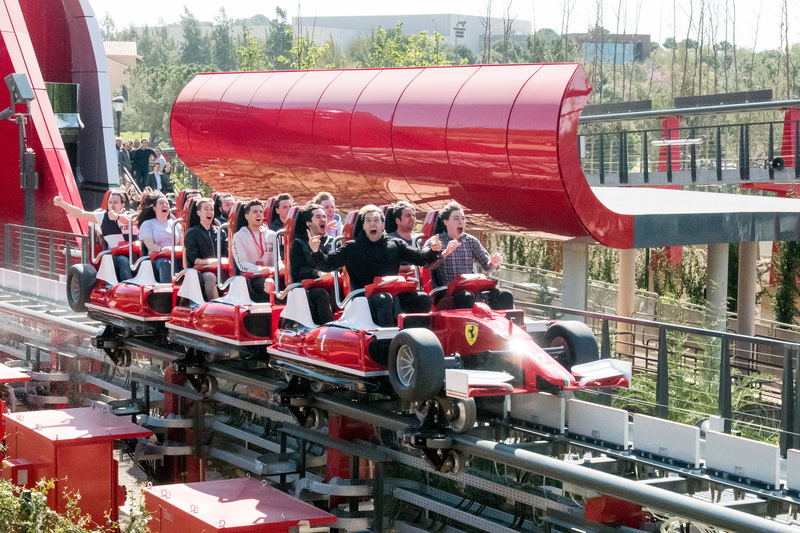 Ferrari Land is obviously for fans and enthusiasts, but above all it is a place where families can have fun and at the same time explore the history of the marque. Visitors take to the seat of a Ferrari Test Driver and are able to experience back-to-back thrills, a vertical climb and an epic zero gravity. A new family ride where visitors face magical, oversized world of interactive challenges, amazing special effects and unforgettable characters. Visitors get to jump inside a giant F1 inspired tyre and get ready to twist, slide and collide into other riders as they rotate at speed. Visitors’ wisdom will be put through pace in this racy interactive game show with amazing prizes to be won. Visitors explore the 4D fantasy universe and dive into oceans, fly over cliffs and venture into ice caves with Nello, a mischievous Ferrari driver accompanied by simulator technology that teases their senses with changes in temperature, moisture, light and movements. An in-depth Ferrari factory tour showcasing how Ferrari GT is made. Racing skills will be put to the test with the state-of-the-art simulator. Get up close and personal with Ferrari’s car design history with this spectacular collection of unique Ferrari models. Climb aboard with this cinematic motion-based simulator and become a trainee engineer alongside a F1 pro. The racing school for kids is the second component of the Ferrari Driving School, kids will receive instructions from trained experts before getting behind the wheel to pilot a perfectly scaled-down Ferrari F1 racer. Visitors would take their seat and be elevated high into the dome of this multi-sensory simulator and soar over spectacular Italian landscapes. Visitors get to enjoy a leisurely change of speed and explore miniature Italy in a small scale Ferrari 250 California, circa 1958. This camp is designed for children to advance their climbing agility and develop problem-solving skills in exciting Ferrari style. Visitors get to dream and drive around Yas Island behind the wheel of Ferrari California. Lessons will be conducted by trained pilots and Ferrari experts. Visitors get to compete in twisting parallel tracks in a Ferrari F430 Spider based on real GT racecourses. Visitors could also shop for special treats, Ferrari fashion and memorabilia. They are able to purchase special Ferrari gifts for family members or friends. By dining at one of their five restaurants, diners will be transported to Ferrari’s Italian homeland with warm hospitality, delicious snacks and authentic cuisine.